Sarah Reynolds, PhD, is a clinical psychologist with over ten years of experience providing DBT training, system consultation, and direct service in a wide variety of settings. These include private practice, community mental health, assertive community treatment teams, residential treatment facilities, state mental hospitals, and inpatient and outpatient psychiatry centers. She developed expertise in DBT during a three-year postdoctoral fellowship at the University of Washington under the mentorship of Professor Marsha Linehan. At the Linehan research clinic Dr. Reynolds was a DBT research therapist, clinical supervisor, and expert adherence coder. From 2002—2007 she was Assistant Professor of Psychiatry at the University of Pittsburgh Medical Center where she led a DBT team, developed an elective rotation in DBT for psychiatry residents, and conducted research on borderline personality disorder (BPD) and women’s health outcomes. 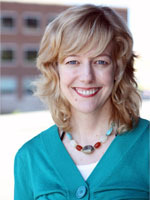 Dr. Reynolds is former Program Chair for ISITDBT (2008 & 2009) and continues to serve as a member of the executive board. She participated as a DBT expert panelist at the 2011 meeting of the National Educational Alliance for BPD (NEA-BPD). She has published both theoretical and empirical articles on DBT, personality disorder, and suicidal behavior. She is in private practice in New York City where she conducts DBT with both adolescents and adults. She also teaches at the Columbia University School of Social Work where she is Adjunct Assistant Professor.